Unlike conventional wisdom, which holds that women should “take it easy” during pregnancy, we view the pregnancy journey like the major athletic event that it is, and teach you how to utilize the unique PROnatal Performance Training Approach to design programs that will help your female clients successfully manage the high-stress demands of pregnancy, childbirth, and motherhood activities — and come out stronger than ever. Through a combination of lecture, discussion, and plenty of hands-on practice, you’ll come away with all the tools needed to coach your clients to achieve their “personal best” during what is truly the event of a lifetime. 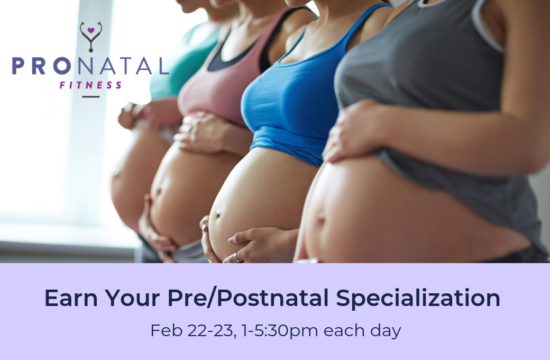 All attendees receive their pre/postnatal performance training specialty certificate and CEUs (ACE: 0.8, NASM: 0.8, AFAA: 8.0). Read the Workshop Details below for more information on what’s included in the workshop, and what sets our education apart.